Explore Stonehenge, Glastonbury, Avebury and other important sites, and delve into the mysticism, hidden energies, megalithic technology, giant legends, crop circles and other mysteries with author and co-founder of Megalithomania, Hugh Newman, and ancient symbols expert from the US, Jj Ainsworth. There will only be 12 spaces for this exclusive tour! Currently 6 spaces are still available. Our journey takes us through a remarkable ten thousand years span, where we'll discover some of the secrets of enigmatic stone circles, the geometry of sacred sites, holy wells’ healing waters and the powerful earth energy currents that connect them all. We'll even have a chance to visit the mysterious crop circles. Your guides will share their research on the lost science, hidden energies, archaic symbolism and sophisticated ancient technologies that are evident at these sites. Please note that we are likely to make discoveries on this journey! Click to pay deposit to confirm your place. 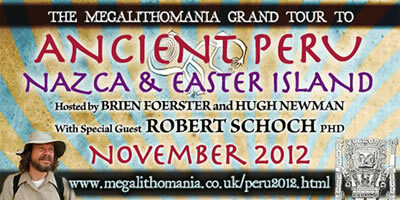 Hugh Newman is an explorer, megalithomaniac and author of Earth Grids: The Secret Pattern of Gaia’s Sacred Sites (2008), Stone Circles (2017) and co-author of Giants on Record (2015). He has been a regular guest on History Channel’s Ancient Aliens and featured in Search for the Lost Giants. As well as organising the Megalithomania conferences and tours, he has spoken at events in the UK, Malta, France, Peru, Egypt, Bosnia and North America. He lives very close to Stonehenge. Jj Ainsworth is a researcher and explorer based in the US, who is an expert on ancient symbolism and connections between sites worldwide. She has featured on numerous radio shows, has published articles on www.ancient-origins.com, and is speaking for the first time at Megalithomania in Glastonbury in May 2018. Your tour hosts, Hugh Newman and JJ Ainsworth will meet the group at Heathrow Airport. We will travel in a private minibus to our hotel in the ancient town of Amesbury. The charming hotel is a 17th-century Listed coaching inn, with a picturesque garden, and a fantastic Thai Restaurant. It was at this hotel that The Beatles stayed during their 'HELP' tour! Introduction lecture with Hugh and Jj and a welcome drink and dinner at the hotel (included), then we leave the hotel for a sunset visit (8.50pm) to Stonehenge. We have arranged for our group to have private special access inside the stones of the world's most famous sacred site during sunset. Standing inside the huge megaliths which have stood in magnificent isolation on Salisbury Plain for thousands of years, you will have time to connect with the stones, meditate or hold a ceremony, or measure the stones, check the alignments and have an opportunity to carry out any research. Experience this World Heritage Site in your own way. This is a rare opportunity to truly connect with a site revered by countless generations. We start the day with an orientation meeting to set the scene for our adventure together. We then drive once again to Stonehenge. We will explore the Stonehenge Landscape, visiting the main Stone circle, the Cursus, mounds, and the sacred 'Avenue' that is oriented to the Summer Solstice Sunrise, as well as the 10,000 year old post holes that align east-west. 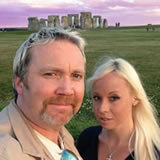 We will look at the astronomy of Stonehenge, the legends of giants and an alternative history of this amazing site. Lunch at Stonehenge. We'll also visit Woodhenge and Durrington Walls where recent archaeological excavations have taken place. On our way back to our hotel we stop at Old Sarum, a site with a very long and varied history, and will explore the energies, former cathedral and castle ruins. It sits on a ley line linking Stonehenge and Salisbury cathedral. For those that choose to join us for dinner we will be dining at the local Curry House that serves delightful, authentic Indian and Bangladeshi Cuisine. (not included). Evening lecture by Hugh Newman. Today, we explore Glastonbury, the legendary Isle of Avalon. We start our visit at Glastonbury Abbey, once the largest and most powerful abbey in all of Britain and the reputed resting place of King Arthur and Guinevere. Rising dramatically from the flat land of the surrounding Somerset Levels, the Tor has been a beacon of spirituality since pagan times and still acts as a magnet for people of all beliefs. 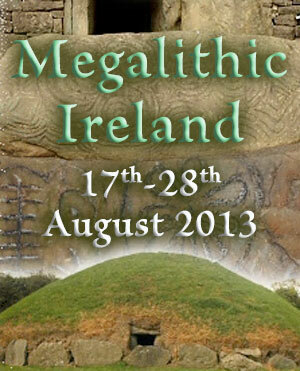 You will hear the stories and the legends as well as experience the powerful energy and atmosphere of this sacred site. The views from the top are spectacular! At its foot lies The Red Spring where iron-rich, healing water has been drank for millenia. The Chalice Well, a true healing place in this land, is located next door and you are encouraged to drink from the holy well where, a local story tells, the Holy Grail is hidden. After lunch we visit the triple stone circles of Stanton Drew in Avon, about 40 mins north of Glastonbury. This is one of the most important megalithic sites in Britain and the third largest stone circle in the country. We also visit the Druid Arms pub, that has 'The Cove' within its gardem, a megalithic part of the greater complex (with perhaps time for a quick ale!). Drive back to Amesbury. You are welcome to join us for dinner at the Thai Restaurant at the hotel (not included). Drive to Avebury Stone Circle. Avebury is the heart centre of megalithic Britain. Here, within the largest stone circle in the world, we find the remains of two stone circles, one solar and one lunar. We also walk the avenue that has parallel megalithic rows snaking through the landscape culminating at The Sanctuary, the ‘head’ of the Serpent Temple. After lunch at the restaurant/pub in the middle of Avebury, we also visit Devil's Den Dolmen, rarely visited, but sitting in a secret valley. Then we visit West Kennet Long Barrow a five and a half thousand year old underground chamber that was used as a tomb, asronomical observatory and a place of initiation. Close by is the largest manmade mound in Europe, the remarkable five thousand year old Silbury Hill. Evening lecture at hotel. Dinner in Amesbury (not included). Drive to Dorset to visit the Cerne Giant, a gigantic hill-figure that has many legends and stories attached to it and is one of the only remaining depictions of 'giants' in Britain. It has a square earthwoek above its head and in 2017 a gigantic crop circle was discovered at its base. After lunch we visit the nearby Nine Ladies Stone Circle and the neolithic Knowlton Henge, that now has a ruined church at its centre. Again, this was part of a much larger neolithic complex. Dinner in Amesbury (not included). After breakfast we drive to Dragon Hill to witness the majestic Uffington White Horse. Today we will visit two ancient energetic sacred sites located on the Belinus ley line, with a very interesting story to tell. Close by is the Neolithic burial chamber of Wayland Smythy, an atmospheric long barrow set within a copse of trees where we can have a picnic lunch if the weather is good or we can take lunch in a nearby village pub. We’ll end our journey visiting a lesser known sacred sites in the Avebury Landscape, Merlin’s Mount, a Neolithic conical pyramid in the grounds of a high-class private college, said to be be the burial place of Merlin. It's geodetic location in the outer Avebury landscape temple makes it worth of a visit. Farewell dinner and drink at hotel (included). Drive to Heathrow for return flight home OR stay on for extra nights to visit other sites (or crop circles) - please enquire if you would like to stay for extra days, based within the Stonehenge landscape to explore. Bon voyage! 1) All Paypal fees and international bank costs must be taken care of by the buyer. These will be added on final payment. We cannot take on these costs as we are keeping the prices right down to create an affordable tour. 2) Megalithomania cannot refund from 30 days before start of tour if you cancel. 3) Megalithomania will refund 50% if you cancel up until 30 days prior to the tour (this does not include deposit). 4) Megalithomania cannot refund deposits up to 60 days prior to tour. Before that we can refund only 50% deposit if you cancel. 5) Megalithomania cannot be held responsible for any injury, accident or stolen goods - please get travel insurance and relevant visas before booking this tour and have a passport with at least 3 months past the end date of the tour. 7) Roommates: We are happy to try to and match our guests with a suitable roommate for those who are traveling alone. If we are unable to do this, you will be responsible to pay for the single supplement. Early registration will facilitate this process. 9) Itinerary may be subject to change if circumstances arise beyond reasonable control and if we cancel the tour you will get a full refund minus any paypal or bank fees. "Aloha everyone, Thank you for the trip of a lifetime! Enjoyed the sites, all of you, and the adventure. A hui hou....until we meet again." "Thank you all for the fantastic time we had in Peru and Bolivia!" "Thank you all for a great trip.. Everyone of you added a brilliant insight into this trip for me and I thank you kindly for that. I normally don’t have patience for humans but you all were beautiful in your own light. Once again I thank you for that." "Hey, Hugh! It was great to meet you and learn so much about ancient mysteries from your vast storehouse of knowledge and insight!" "The ancient Peru / Bolivia tour hosted jointly by Hidden Inca Tours and Megalithomania answered to all my expectations in every way but one, which it exceeded. I got to see the most important sites for my introduction to ancient megalithic Peru and Bolivia, of which surely Sachsayhuaman and Puma Punku (as part of the Tiahuanaco complex) were personal highlights. The hosts were very informative and also fun to be around. No stuffiness, no boring lecturing and an atmosphere of being among intellectual equals, even though in knowledge and experience our hosts far exceed my level. In general the tour was very well organised and where room for improvement was found and commented on, that input was welcomed and actually implemented expediently. So in all I had a wonderful experience and would recommend this to anyone. Now for the part exceeding my expectations... that was the group dynamics. I admittedly had expected a group of mainly elderly pensionados. Fine for me, a very fit 41 year old, but not thrilling either. But hey, no such thing! The group was actually a wonderfully diverse and blended crew of people from all walks of life, young and older. This made for a truly fun two weeks and lots of conversations on and off topic with views and multifaceted interpretations so diverse as to be almost kaleidoscopic. Open minds. I like! Thank you Irene, Gustavo, Brien, Hugh, Jim, Antonio, Sr. Luis and son, our very skilled bus drivers and of course my fellow Megalithomaniac group. As Arny puts it best: I'll be back! " "We still can't forget Peru and Bolivia, all the wonderful sites and moments of our great trip. In spite of all the hardships it will remain the most memorable journey of our lives. It was great to meet all of you, to hear your stories and live great moment together. Thanks for sharing your thoughts and experiences with us. Today we would like to wish you all lovely Christmas an much hapiness in the coming year. And of course more fantastic journeys to most mysterious places in the world"
"Hal and I are still missing Peru and especially all the wonderful friends we made along the journey! We're going to have pisco sours instead of egg nog this Christmas and we'll drink a toast to all Megalithomaniacs everywhere. Warmest wishes for a joyous holiday season and looking ahead to more adventures in 2017! " 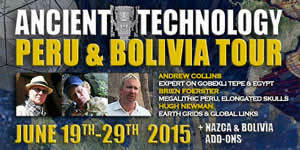 Feedback from 'Ancient Technology Peru & Bolivia' 2015 Tour with guest host Andrew Collins. "Just to say a big thank you for the trip, such fun and full of giggles. From years of reading about and seeing pictures of so many of the sites visited on this trip, to finally feeling the incredible energies that surround them, was for me personally an amazing experience. So thank you all for putting together such a memorable tour. Great menu, interesting and fun crowd of fellow travellers. Good places to stay. Great stuff!" 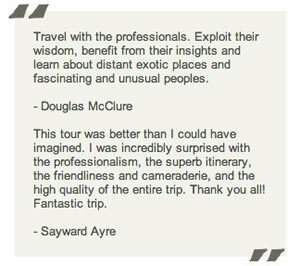 "I want to once again thank Brien, Hugh, Irene, and Gustavo for this great tour. It definitely exceeded my expectations. You get to see many sites that would otherwise be more difficult to get to on other tours or by yourself. The accommodations were excellent and everyone was very friendly. 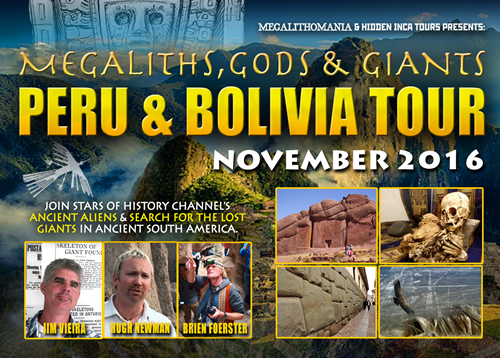 if you like interesting information, exploring ancient sites, and good company this is the tour to go on!" "For us the tour was an amazing opportunity and a privilege to explore the earth energies at an incredible number of megalithic sites. We learnt so much and feel truely grateful for what was revealed to us, and to all the organisers, especially Hugh & Brien, for putting together such a memorable and stimulating tour. 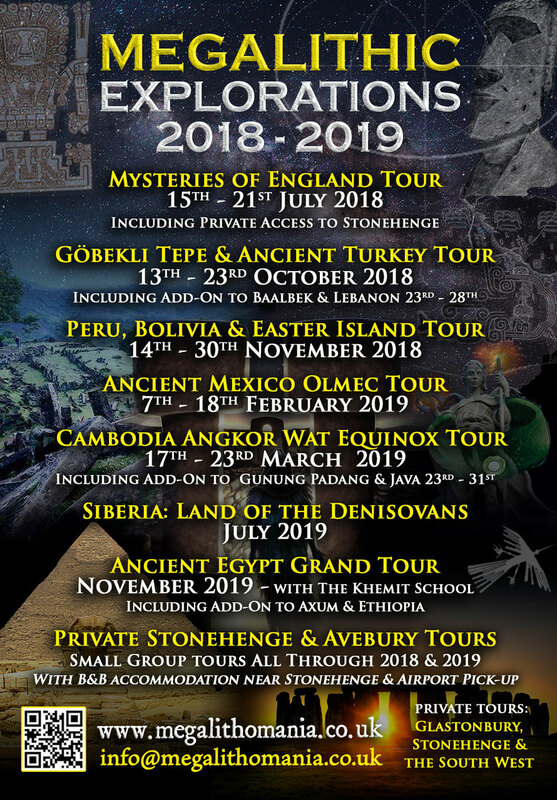 It was also a joy to be in the company of so many like minded people with a deep curiosity about the ancient ancestors"
"Your tour exceeded our expectations in nearly every way. We saw, learned and experienced more than we ever would have on any other kind of tour. In addition, we traveled and made new friendships with people from all over the world. This trip is definitely one of the highlights of our life travels! For this we would like to thank you, Hugh, Irene, Cameron and Glen and David and Jennifer from the bottom of our hearts!" "I loved the tour! Many thanks to all organisers, especially Irene :) I hope you are enjoying a break from questions and demands. Was great to meet you all and being in cusco without you all is not the same. 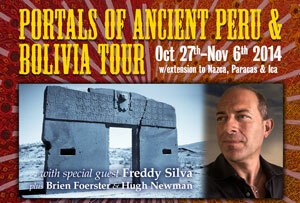 I hope the tour has deepened your interest in the ancient mysteries like it did for me." "I thought the trip was excellent. I learned so much and from so many people on this trip. Thanks to everyone for making it great." "Thanks for a great Megalithomaniac Tour! The whole group gelled together with a great positive energy in this wonderful adventure."